When I was 16, using my £1.50 an hour money, I purchased this mail order from an advert in a guitar magazine. I’d decided I wanted to be a bass player, probably as I wasn’t any good at the guitar (I’m still not any good at the guitar). I believe, although I have no way of discovering, this came from GAK. Specs are hard to come by, but I drilled a hole in it to work out what’s in there (part of me wondered if it was solid plastic) and it seems to be made of splintery wood – so I probably hit a layer of plywood. It suffers from particularily enthusastic reviews on Harmony Central, considering the price. It was available in Black, Bone White, Torino Red, Honey Yellow, Apple Red Metallic, Green Metallic and Three Tone Sunburst. Two jazz bass pickups each with their own tone and an overall volume knob. 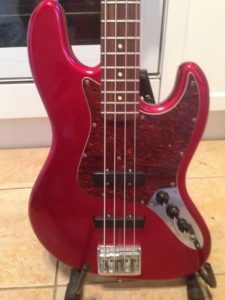 ​Following picture borrowed GumTree, also this has the rosewood fingerboard. So I’ll replace it with a proper one soon.